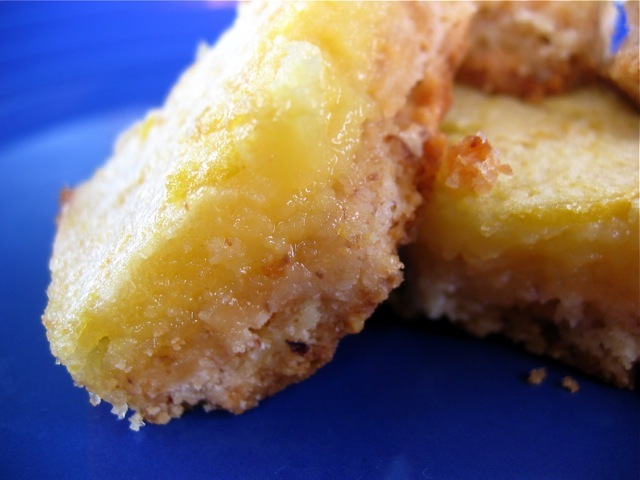 There are several schools of thought on lemon bars, ranging from purist (lemon and shortbread only) to eclectic (extra flavorings) and from sweet (lots of sugar in the bars, plus more dusted on top) to tangy (hold the sugar, please). These bars are clearly at the eclectic/tangy end of the spectrum. If you aren't wild about ginger or pecans, skip 'em. And if you want even more of a sugar bomb, sift some powdered sugar atop the finished bars. Place a rack in the middle of the oven and preheat the oven to 350 degrees. Grease a 9-by-13-inch baking dish. Scrape the crust mixture into the prepared pan and press it down firmly and evenly to a depth of ½ inch. Bake for 20 minutes, until lightly golden. Rotate the pan halfway through the baking time. Make the topping: Combine the sugar, flour, and salt in a bowl. Mix in the eggs, then stir in the zest, lemon juice, and milk. Remove the crust from the oven and pour the freshly mixed topping over the hot crust. Bake for 20 minutes, until the topping is just set. Let cool completely on a rack before cutting into squares to serve. For lemon-lime bars, use 2 large lemons and 2 large limes in place of the 4 lemons. For easier slicing and serving, line the entire baking dish with aluminum foil instead of greasing it with butter, making sure to include extra foil wrapped over the handle ends. When the uncut bars are cool, lift them out using the foil handles. Place the bars on a cutting board, peel back the foil, and slice into squares with a large knife.